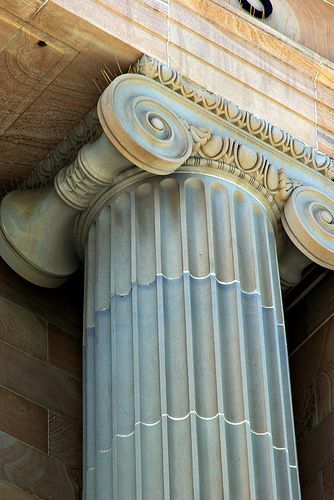 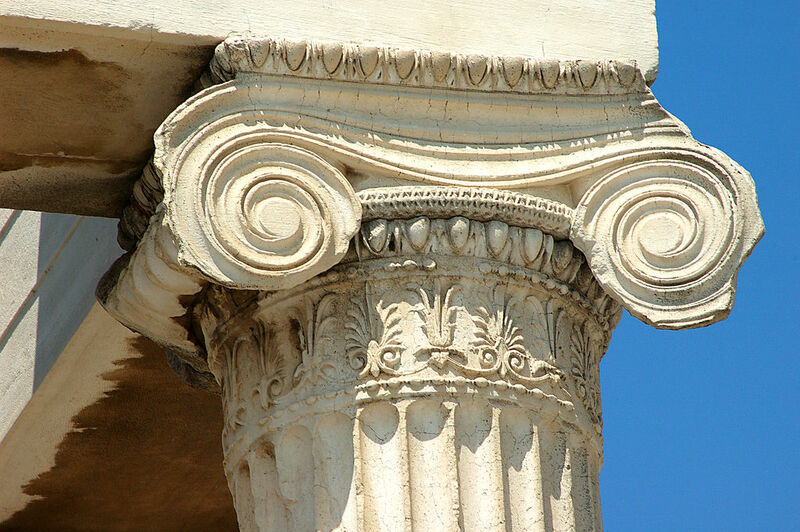 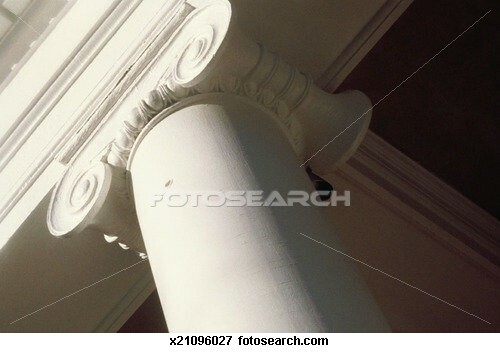 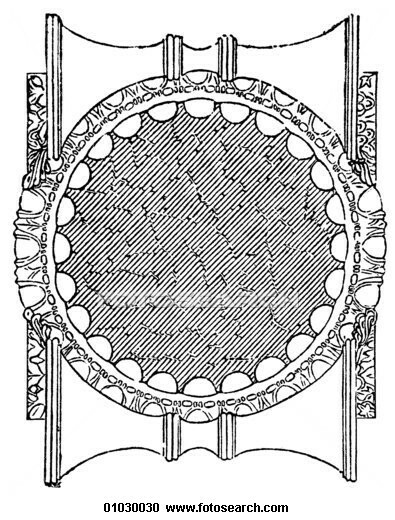 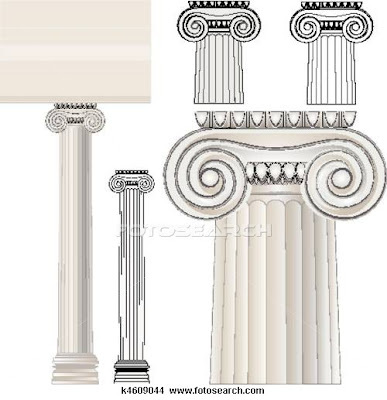 The Ionic columns normally stand on a base which separates the shaft of the column from the stylobate or platform; The cap is usually enriched with egg-and-dart. Originally the volutes lay in a single plane (illustration at right); then it was seen that they could be angled out on the corners. 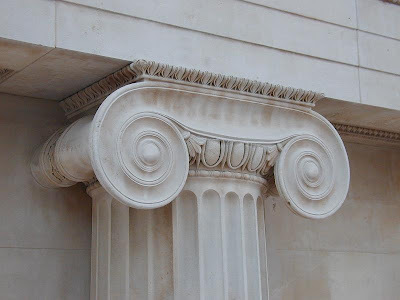 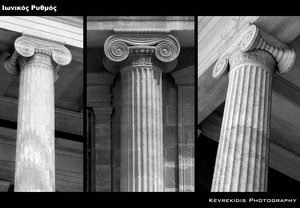 This feature of the Ionic order made it more pliant and satisfactory than the Doric to critical eyes in the 4th century BC: angling the volutes on the corner columns, ensured that they "read" equally when seen from either front or side facade. 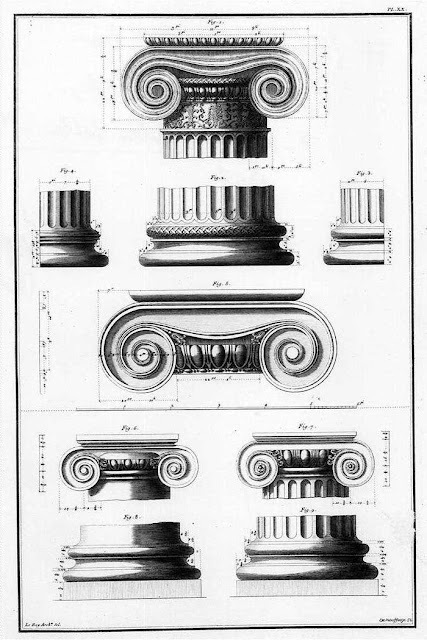 The 16th-century Renaissance architect and theorist Vincenzo Scamozzi designed a version of such a perfectly four-sided Ionic capital; Scamozzi's version became so much the standard, that when a Greek Ionic order was eventually reintroduced, in the later 18th century Greek Revival, it conveyed an air of archaic freshness and primitive, perhaps even republican, vitality. 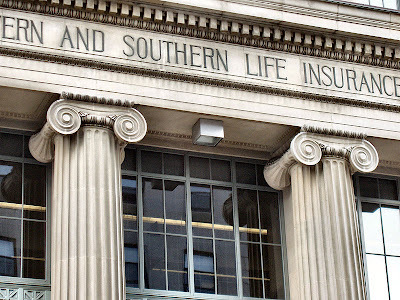 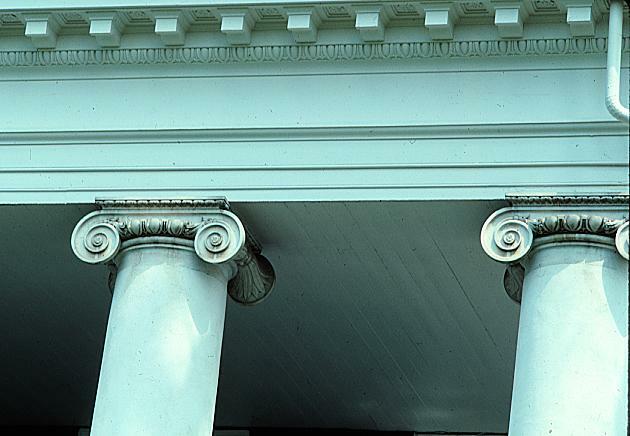 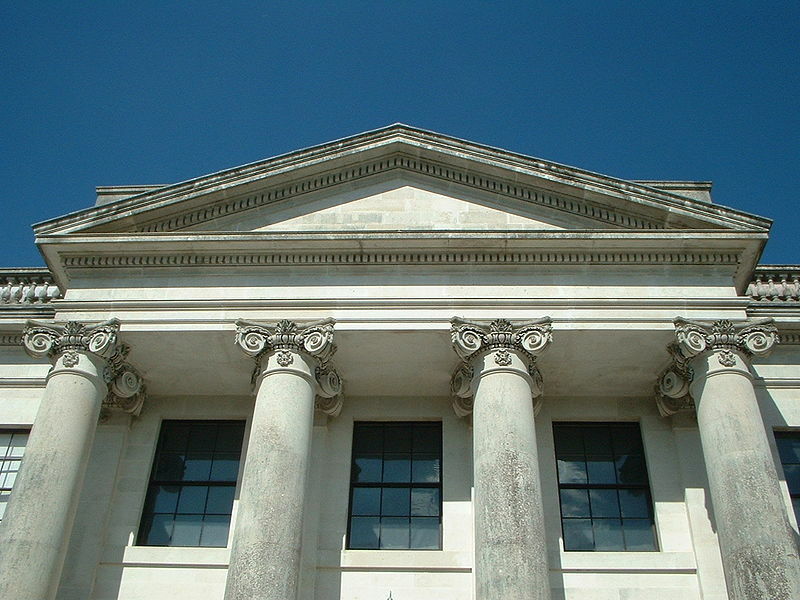 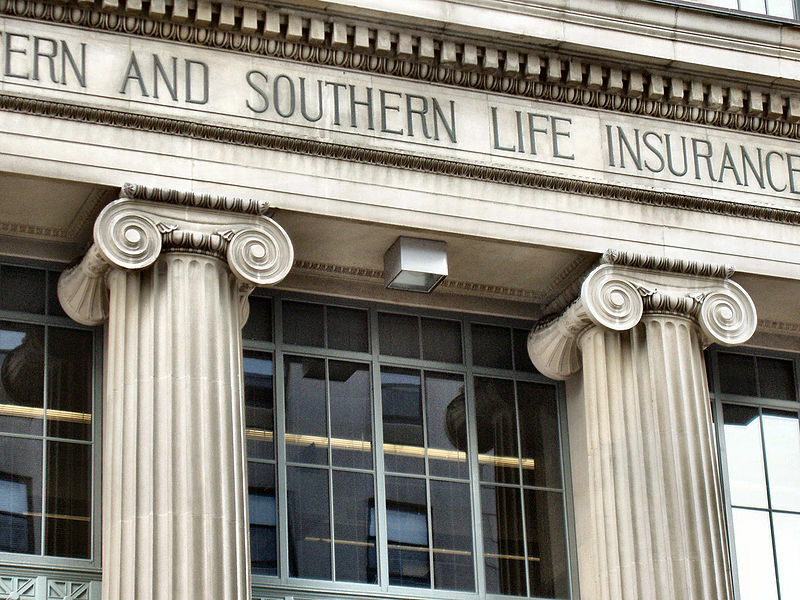 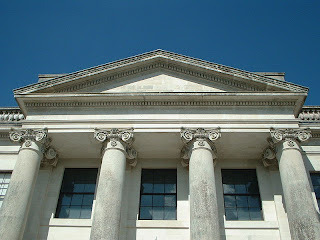 Ionic capitals on a neoclassical Cincinnati life insurance headquarters. Below the volutes, the Ionic column may have a wide collar or banding separating the capital from the fluted shaft, as at Castle Coole (below, left). 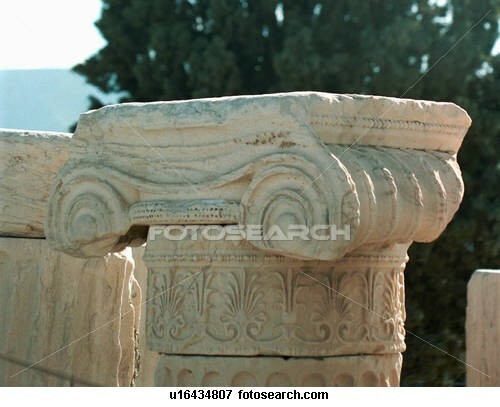 Or a swag of fruit and flowers may swing from the clefts formed by the volutes, or from their "eyes." 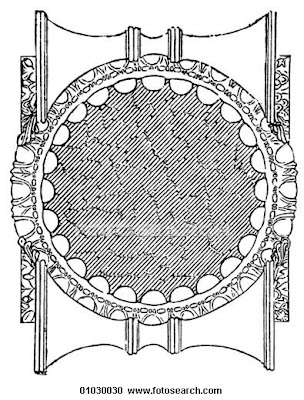 After a little early experimentation, the number of hollow flutes in the shaft settled at 24. This standardization kept the fluting in a familiar proportion to the diameter of the column at any scale, even when the height of the column was exaggerated. 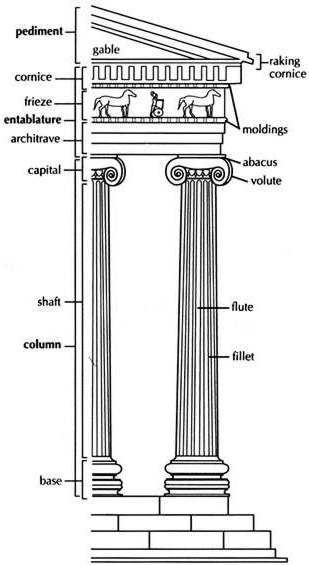 Roman fluting leaves a little of the column surface between each hollow; Greek fluting runs out to a knife edge that was easily scarred. 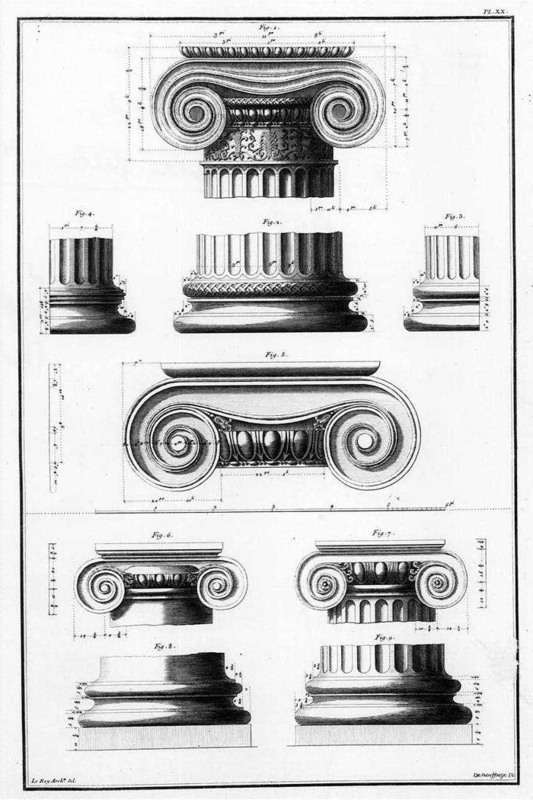 The major features of the Ionic order are the volutes of its capital, which have been the subject of much theoretical and practical discourse, based on a brief and obscure passage in Vitruvius. 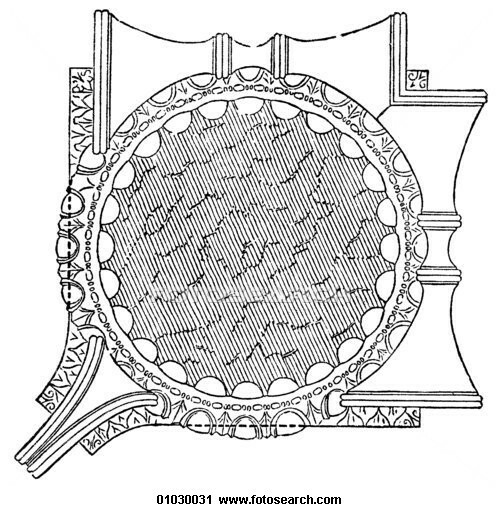 The only tools required were a straight-edge, a right angle, string (to establish half-lengths) and a compass. 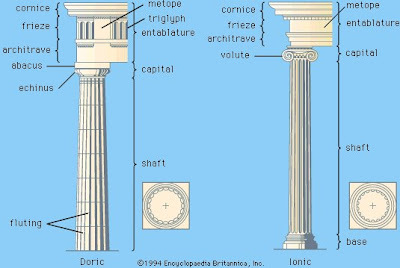 The entablature resting on the columns has three parts: a plain architrave divided into two, or more generally three, bands, with a frieze resting on it that may be richly sculptural, and a cornice built up with dentils (like the closely-spaced ends of joists), with a corona ("crown") and cyma ("ogee") molding to support the projecting roof. 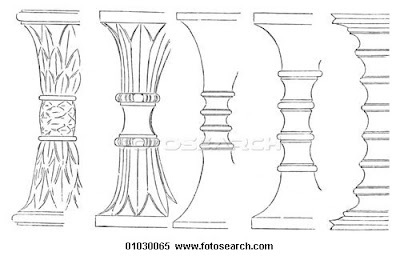 Pictorial often narrative bas-relief frieze carving provides a characteristic feature of the Ionic order, in the area where the Doric order is articulated with triglyphs. 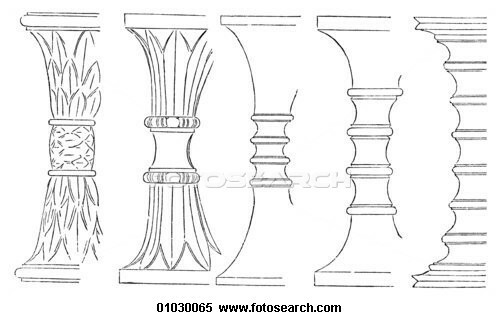 Roman and Renaissance practice condensed the height of the entablature by reducing the proportions of the architrave, which made the frieze more prominent. 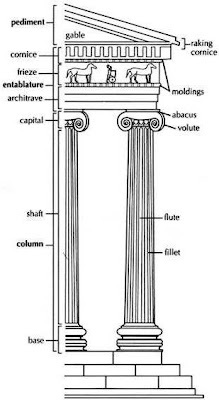 Vitruvius, a practicing architect who worked in the time of Augustus, reports (De Architectura, iv) that the Doric has a basis of sturdy male body proportions while Ionic depends on "more graceful" female body proportions. 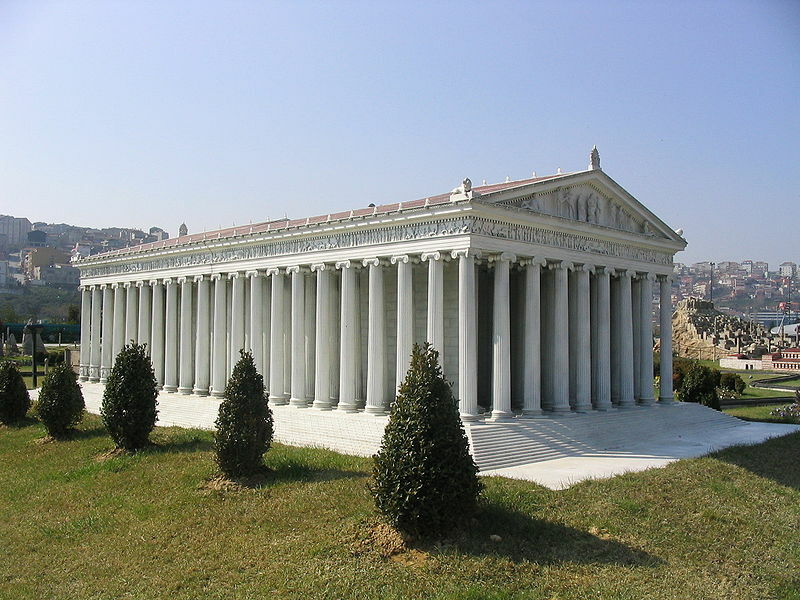 Though he does not name his source for such a self-conscious and "literary" approach, it must be in traditions passed on from Hellenistic architects, such as Hermogenes of Priene, the architect of a famed temple of Artemis at Magnesia on the Meander in Lydia (now Turkey). 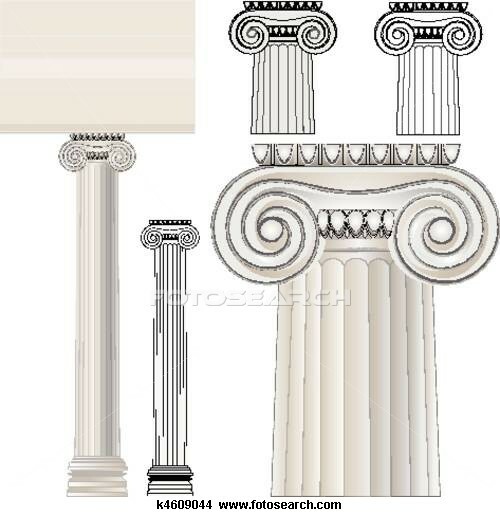 Renaissance architectural theorists took his hints, to interpret the Ionic Order as matronly in comparison to the Doric Order, though not as wholly feminine as the Corinthian order. The Ionic is a natural order for post-Renaissance libraries and courts of justice, learned and civilized. 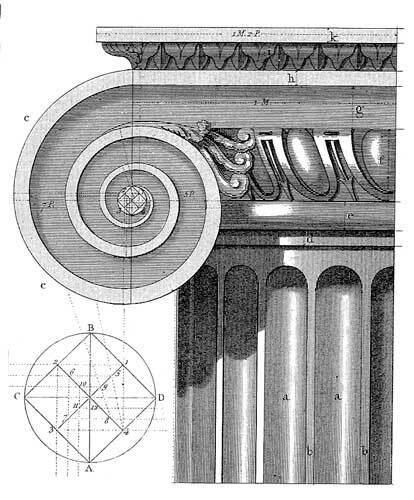 Because no treatises on classical architecture survive earlier than that of Vitruvius, identification of such "meaning" in architectural elements as it was understood in the 5th and 4th centuries BC remains tenuous, though during the Renaissance it became part of the conventional "speech" of classicism. 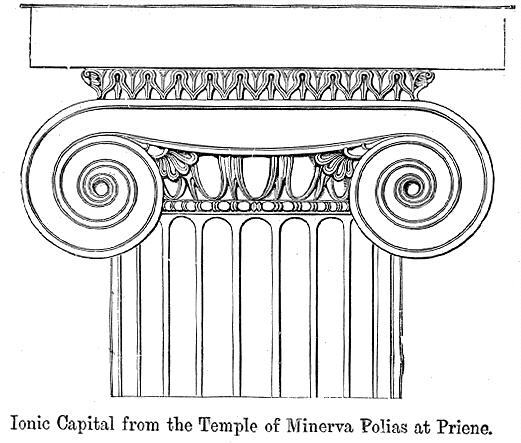 The Parthenon, although it conforms mainly to the Doric order, also has some Ionic elements. 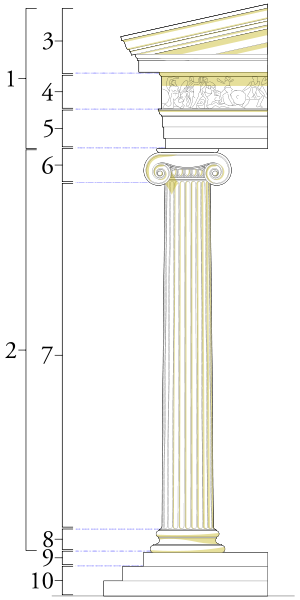 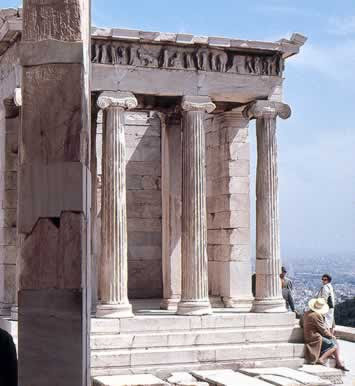 A more purely Ionic mode to be seen on the Athenian Acropolis is exemplified in the Erechtheum. 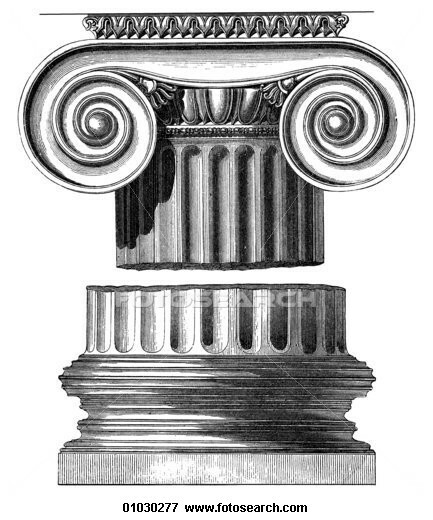 From the 17th century onwards, a much admired and copied version of Ionic was that which could be seen in the temple called that of "Fortuna Virilis" in Rome, first clearly presented in a detailed engraving in Antoine Desgodetz, Les edifices antiques de Rome (Paris 1682).